fre:ac is a free audio converter and CD ripper integrating various formats and encoders. It supports MP3, MP4/M4A, Windows Media Audio (*.WMA), Ogg Vorbis, FLAC, AAC and Bonk files. 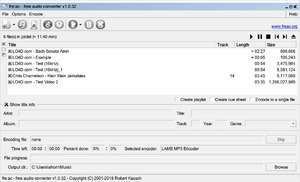 fre:ac makes it easy to convert your audio CDs to MP3 or WMA files for use with your hardware player or favourite audio software. freac download been highly rated by our users.